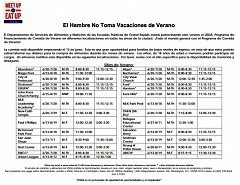 All Grand Rapids youth 18 and under may access free breakfast and lunch at several locations, with no registration or papers necessary. Families are encouraged to text FOODMI to 877-877 for information about locations nearest them, meal types, times and directions. 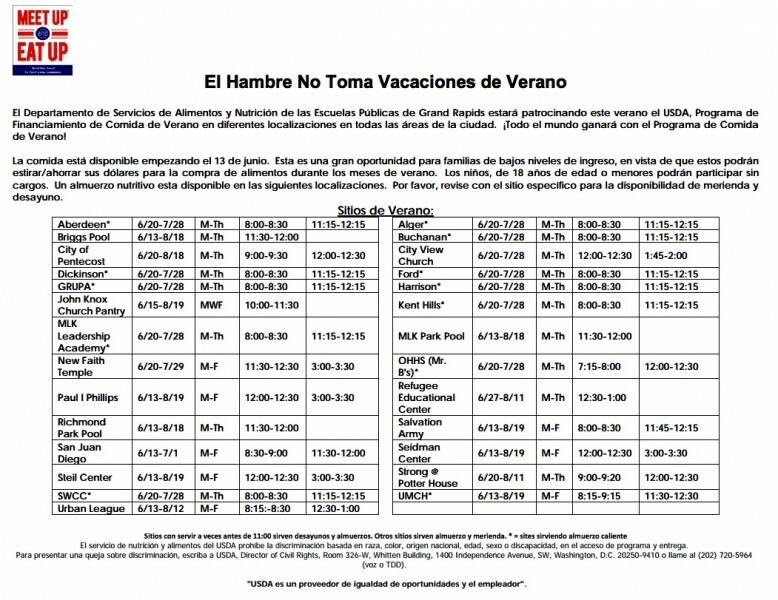 Hunger and food insecurity don’t take a summer vacation. Healthy kids who are successful in the classroom need good nutrition, and they need it year round. 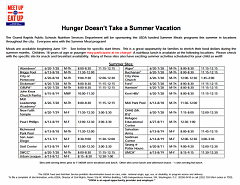 National benchmarks suggest that 40 percent of kids who regularly eat free or reduced price school meals also need access to summer meals if their nutritional needs are to be adequately met. Kids’ Food Basket, in collaboration with Michigan No Kid Hungry and the Michigan Department of Education (MDE), is serving as a promotional partner for the free Meet Up and Eat Up™ Summer Food Service Program (SFSP) in Grand Rapids and surrounding areas. The Meet Up and Eat Up™ sites serve nutritious meals to children 18 and under living in low-income areas (where 50 percent or more of the students qualify for free or reduced price school meals). 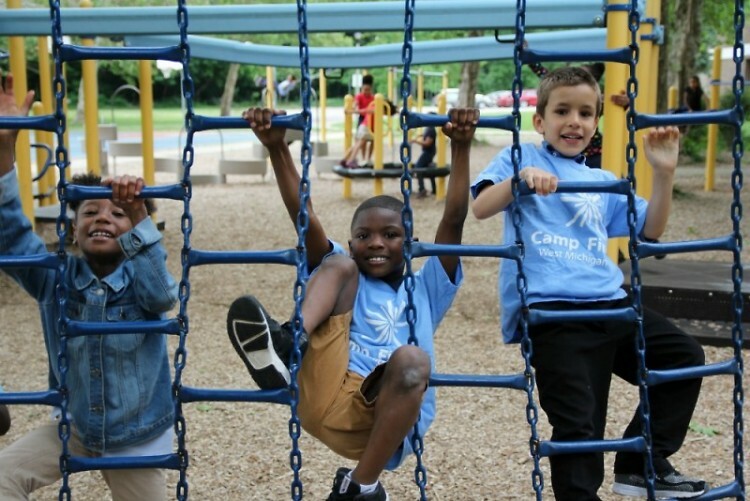 The program can operate in schools, public housing centers, playgrounds, camps, parks, and faith-based facilities. The program begins mid-June, and more than 30 sites in the greater Grand Rapids area will be serving free meals to children. “Meet Up and Eat Up provides our students not only with an opportunity to receive a nutritious meal, but to connect with friends and fun activities at the school, as well,” said Gwen Heatley, Challenge Scholars Coordinator at Harrison Park. Parents, families and caregivers can easily find the location nearest them by calling 2-1-1, or texting FOODMI to 877-877. 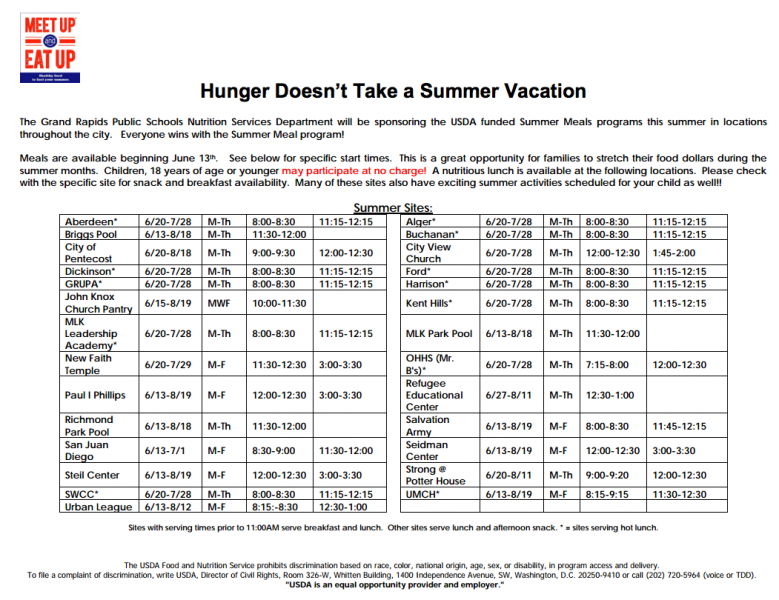 The MDE also provides the Summer Food Service Program (SFSP) Site Locator Map, which allows families to identify the nearest Meet Up and Eat Up™ site, including information about locations, meal types, times, and driving directions. The map can be found at http://www.mcgi.state.mi.us/schoolnutrition/. Meet Up and Eat Up allows the Boys & Girls Clubs to support students inside and outside the building, said Shawn Flood, Club Director for Paul I. Phillips Club. People and organizations interested in more information about getting involved as a site, an activity provider, or a volunteer this summer should contact Julie VanGessel at 616-235-4532 ext 234 or use the MDE website at www.michigan.gov/sfsp. Additional information and Meet Up and Eat Up resources are available at www.michigannokidhungry.org.